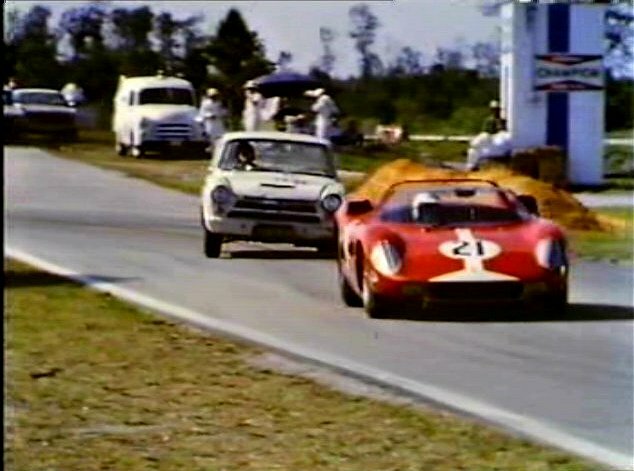 IMCDb.org: 1964 Ferrari 330 P  in "Classic & Sports Car Film Collection, 1998"
1964 Sebring 12 hours - works Ferrari 330 P (#0822) John Surtees)/Lorenzo Bandini, finished 3rd. The car behind is Ford Lotus Cortina Jim Clark (GB)/Ray Parsons (USA), finished 21st, registered 168 RUR. One of the first 2 works-prepared Lotus Cortinas, used in England in 63 before shipping to US - /vehicle_172665-Ford-Cortina-Lotus-1964.html .